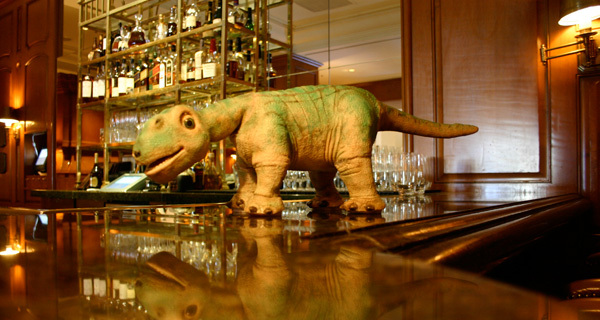 Pleo ~ he’s not just a robot. And yes he’s real (contrary to those blasphemous rumors that were flying around earlier this year). 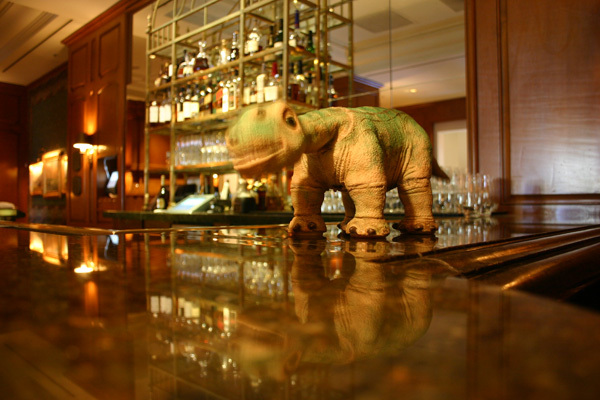 Met up with Pleo (and Ugobe CEO, Bob Christopher) as they made their way through Beverly Hills ~ at the Peninsula Hotel Bar. This one week old Camarasaurus is a robot that pushes the bounds of emotional AI. I’m not a big “awwwww how cute” kind of girl, especially when it comes to my tech. But as much as i love the look and style of my vicious RoboRaptor, there was SOMETHING about this little guy that made me need to poke/pet it as soon as i sat down with it… and i only got to play with the prototype, whose skin isn’t even as perfect as in the production models! This is one product that manages to transcend the remote controlled robot feeling that i get from most of the Wowee products ~ and its not as creepy as the furby (although distantly related) ~ and has more character than the Nabzatag… so i think i’d have to categorize it as more of a lifestyle product… it kind of encompasses a little of all of its predecessors in the field, and really pushes the emotional aspects… Can you believe that each Pleo will be hand colored??? And each and every one will apparently evolve into their own “personality”. 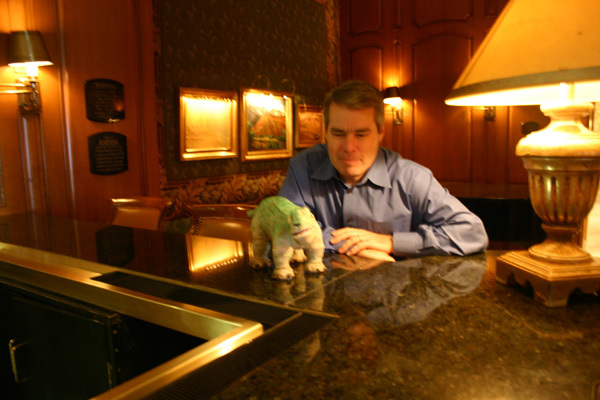 The future of Pleo? Post prototype perhaps? Once you look beneath his skin, you realize how complex he really is. It’s a computer trapped in a 1 week old dinosaur! I’m impressed with the fact that it will be priced at $250, and has openly embraced the open source community so nicely… in fact the pleo will have a USB connection, an SD slot, and you can openly hack him up… they will even have a web UI for even the youngest kids to play with and program behaviors and play patterns, and even teach it new things. Their forethought to allow all levels of experience to take control of their Pleo into their own hands ~ might make this just the toy to help peak some of the younger kids interests to help create the future of AI and Robotics. If the interface really does become as simple as it seems in the mockup below ~ this little guy has a lot of potential. 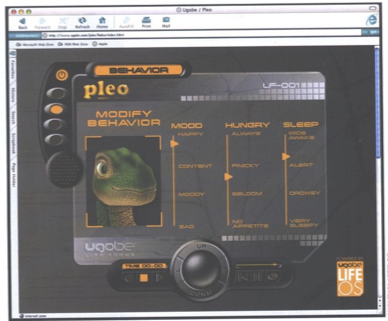 Ugobe’s Pleo ~ scheduled to be released end of Q1 2007.
for some fun videos ~ i love the ones over at Sci-Fi’s Tech blog. i know it is a camarAsaurus ~ but every time i read/hear the name, i think of a Camaro. The car. you can preorder pleo from walmart, bestbuy, sharper image and a few other places, the ugobe store has already sold out!! I ordered my pleo in june, he will be arriving around christmas, go to pleoworld.com for more info!!!! I saw and played with one of these at the opening of a resteraunt, the owners sister was one of the designers and she was marketing them. they are REALLY cool..trust me, im definetly getting one. The day it comes out there won’t be any left. If you really wanted one, you’d pre-order it. In case you didn’t know, Pleo is now available for pre-order in the US and UK. You can find pre-order links as well as Pleo news and blogs, photos and videos, an FAQ and more at Pleo HQ. I just pre-ordered 2 pleos this morning. My Order Confirmation number was 2602 so I don’t think I got one of the first hatchings which is unfortunate. I’m very excited. I only found out about Pleo today and already my bank account is $700.00+ lighter! eeek!! My husband and 3 years old daughter want one so bad. Can you preorder? Please let me know if you can and where and when to get one. Thanks! what happens if it falls over? When is it going to start selling? I will wait in line to get one. Please email me the date. i honestly cannot even describe how badly i want one of these. i will buy one the day it comes out. oh my god i want one.